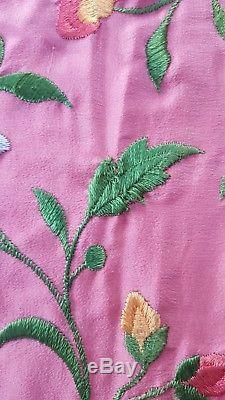 Antique Vintage Embroidered Pink Silk Piano Shawl Scarf w Long Fringe Wearable. 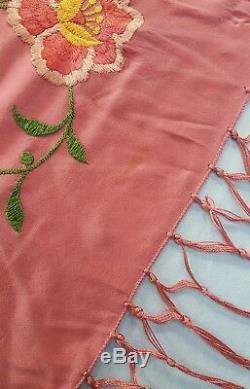 Pretty vintage or antique embroidered piano shawl. 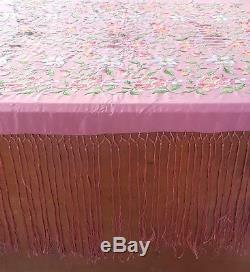 Very large and measures about 51" by 48" not including fringe. 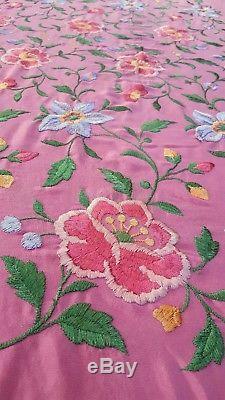 Color: Pink with colorful embroidery. 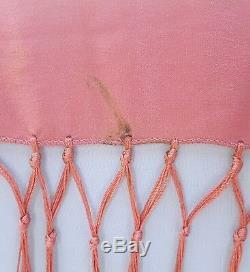 Closest color representation are the photos taken of the shawl on the dress form. Lined: No, embroidery on both sides though it looks like one side is meant to be the back. Material: No tag, feels like silk. I do not see any holes or rips. Silk is strong and wearable. This was stored away in a very old home that had been shuttered for decades. 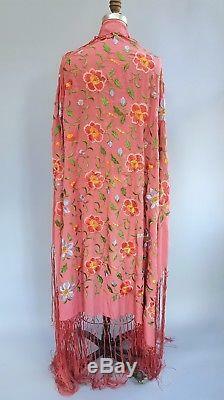 It was stored with a matching black shawl (will be listed soon) and some 20s / 30s dresses. I don't think this shawl was used. Has not been laundered or pressed. Thanks for stopping by and don't forget to check out my other items! Tems are authentic and s. Most items are pre-owned and gently used unless otherwise stated. So please contact me if you have a problem with your order! These items have had a previous life and will naturally show signs of wear and age. I do my very best to make note of any flaws in the item description, but may overlook small flaws. These charges are the buyers responsibility. 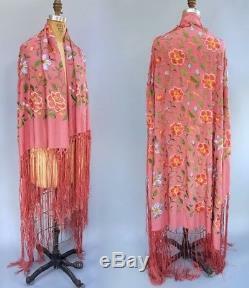 The item "Antique Vintage Embroidered Pink Silk Piano Shawl Scarf w Long Fringe Wearable" is in sale since Tuesday, December 4, 2018. 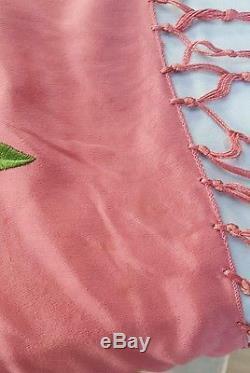 This item is in the category "Antiques\Linens & Textiles (Pre-1930)\Embroidery". 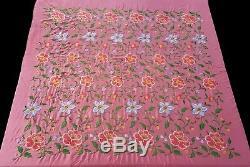 The seller is "cawthornecollectionshop" and is located in Grand Rapids, Michigan. This item can be shipped worldwide.